For some buttons, like family and friends’ names or local places, you may want to add your own photos. You may also find that there aren’t symbols for names of some specific things, like foods or TV shows. 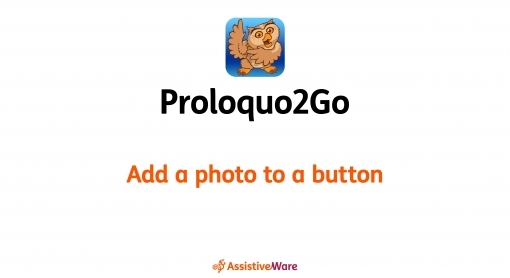 You can always add your own image to any button in Proloquo2Go. Navigate to the folder containing the button you want to add a photo to. Tap the button to select it. Tap the button preview in Basics. This opens the Picture Options menu. To add a photo stored in your device’s Photos app or camera roll, select Choose a Picture. If asked, confirm you want to give Proloquo2Go permission to access Photos. Then, tap All Photos or the album your photo is in. When you find the photo you want, tap to select it. If you don’t want to use the entire photo, drag the edges of the box in the Choose Photo window to crop your photo. Then, tap Use to add it to your button. Exit Proloquo2Go and go to your Settings app. Go to Privacy, then Photos. Make sure Proloquo2Go is set to Read and Write. Sometimes, when you pick a photo, Choose Photo may only show a black screen. This means the photo is stored in iCloud and not fully downloaded to your device. Proloquo2Go cannot access photos stored in iCloud. You can set all photos to download to your device in the Settings app. Tap the top Apple ID, iCloud, iTunes & App Store section. Make sure Download and Keep Originals is checked. Please note that the download process is controlled by Apple’s servers. It can take several days for all photos to finish downloading to the device. Note that it is possible to have so many photos that they cannot all fit on your device. If this is the case, not all photos will be downloaded even with Downloaded and Keep Originals checked. To add a photo from Dropbox, select Choose a Picture. Then, tap Select from Dropbox. Tap the photo you want to select it. Crop the photo as desired in Choose Photo, then tap Use. If Select from Dropbox does not appear, Proloquo2Go does not have permission to access your Dropbox account. To do this, Dropbox must be toggled ON in Options > Services. If you don’t see your photo, go into your Dropbox account and make sure the file is in your Apps/Proloquo2Go folder. This is the only Dropbox folder that Proloquo2Go can access. To take a new photo and add it to your button, select Take a Picture. Take a picture using the camera, then choose Retake or Use Photo. Go to Privacy, then Camera. Toggle Proloquo2Go’s setting to ON. You can copy a photo from another app, then paste it onto the button. To copy an image, tap and hold it until a menu with the options Save Image and Copy appears. Select Copy. Then, return to Proloquo2Go. In the Picture Options menu for your button, select Paste Picture.